Provides updates and summaries of ESSA events to let you know what will and has been going on. 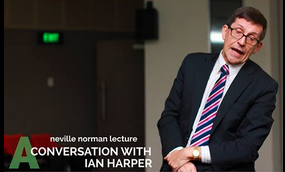 Didn’t make it to our Conversation with Ian Harper event? Never fear, ESSA is here to give you a run-down of the best parts of the talk. Despite high living standards, Australia is experiencing declining productivity. Our false sense of security as a nation is not dissimilar to a procrastinating student with one-day buffer before deadline. Saul Eslake, speaking at the ESSA Inaugural Neville Norman Lecture, is among the foremost economists ringing the alarm bell. ESSA was delighted to see new faces at Academic Advice day. A warm welcome to all! A video recording of Martin Wolf sharing his plentiful experience in writing and discussing economics. Recap of this week’s seminar with Martin Wolf, jointly hosted by ESSA and CAINZ. Exciting news for ESSA next year! Mark Nicholson is a University of Melbourne alumnus, having graduated with a Commerce/Law degree.